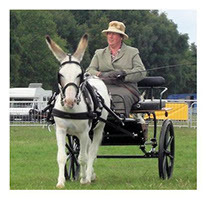 Whether you want to enjoy a quiet social drive around the country lanes, or have a competitive spirit and you aspire to success in the show ring, or performance event, the Donkey Breed Society has a strong and active driving section to guide you. 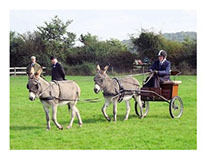 Led by a committee of active and knowledgeable Whips, the Donkey Breed Society driving enthusiasts are willing to offer help and guidance to anyone wishing to take up the reins and enjoy this wonderful pastime. 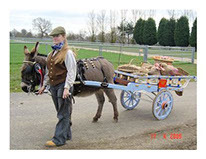 For Donkey Breed Society members wishing to start driving their donkey, we can put you in touch with experienced Whips in your region who will be able to offer informed advice and identify suitably qualified instructors to help smooth your way forwards. We can also offer advice as to suitable vehicles and harness appropriate to donkeys, and identify vehicle builders and harness makers where they can be purchased. We have available a leaflet explaining ‘Long Reining’ as a training route to driving, which is available from the Society Secretary. To follow on, we also have a ‘Driving’ leaflet, explaining the next steps of harness fitting and putting to a vehicle, ensuring safety and comfort for both donkey and Whip. Leaflets are free of charge to members; non-members should send a stamped addressed envelope and donation of £2.00 with their request. 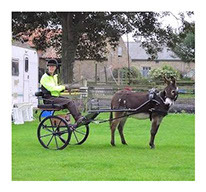 Ideally the potential driving donkey needs to have good conformation and be of sturdy build with good free movement; however, many donkeys not previously seen as having driving potential have found a new career and interest through driving in later life; as have their owners! The Donkey Breed Society Driving Committee has created a series of tests to identify safe practices and to assess the candidate’s knowledge of correct procedures in a controlled situation. Please contact the Driving Committee Chairman for a list of Testers and your regional committee or regional delegate to request training and practice days. 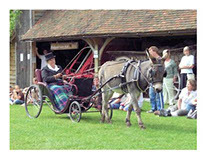 Donkey Driving Classes: at affiliated shows have gained in popularity over the last forty five years and driving demonstrations are occasionally a major ring attraction at shows and other events. Driving Classes: are classified according to the type of vehicle driven. Private Driving Class: is for vehicles of traditional profile and identifiable type to resemble the design of a carriage builder before early 20th century. The vehicle may be made from modern materials but must have traditional style springing and carriage lamps if appropriate. AN EXERCISE VEHICLE is one that does not meet this criteria. Where the turnout is judged on presentation as well as the manner in which the donkey performs; which means that the vehicle and harness must be correct, fit well and be polished to perfection. 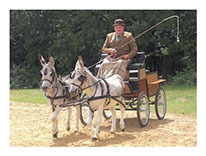 Open Driving Class: is for Exercise Vehicles and any that are not acceptable as Private Driving Vehicles, where the turnout is judged on presentation as well as the manner in which the donkey performs; which means that the vehicle and harness must be correct, fit well and be polished to perfection. Trade Vehicle Classes: are less popular, as the vehicles do not naturally lend themselves to any other class, but an array of small vehicles used to deliver milk and bread, is to be found, as are small agricultural vehicles, and can be of great interest to the general public. Agricultural Vehicle Classes: are seldom seen today, but there is an interest in this type of turnout and in working donkeys as agricultural animals in general, with workshops organized in some regions. 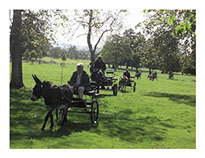 Donkeys are taking part in ploughing competitions and spreading the word through demonstrations at lifestyle museums. Long-reining Classes: At some shows, long-reining classes are held where you can demonstrate the training level of the donkey, without the need to purchase or transport a driving vehicle. DBS Trec: A competitive and social event, for both long reined and driven turnouts, comprising a marathon course and skills test. Indoor Driving Trials: Donkeys regularly take part in events staged for ponies, with negotiations underway to give donkeys a higher profile with classes dedicated to them. Rosettes: Members who drive competitively at shows in mixed classes of horses, ponies and donkeys or mules, are eligible to apply for a special ‘Donkey Turnout’ rosette from the Donkey Breed Society Shows Co-ordinator. Competitors are eligible for the award just by virtue of entry, they do not have to win or be placed in the class, but the turnout must be forward in the class on the day, and a copy of their entry form submitted to the Shows Co-ordinator. Best Trade Vehicle Rosette and Junior Whip Rosettes can be claimed from the Show Co-ordinator once a show has taken place and results published. Traditional Vehicle Certificate: A Certificate will be awarded to members who attend any show, parade or display with a traditional vehicle. The certificate will be awarded at the Annual General Meeting to each Whip who needs to list all their events to the Driving Committee. Donkey ‘S’ Miles: An award to encourage social driving with notable milestones being marked by an award of a medal at the Annual General Meeting. This is a self-certified scheme once enrolment has been confirmed; mileage is recorded using a GPS system or milometer. Turnouts being driven on public roads should be covered by a Third Party Indemnity Insurance, and the owner’s level of activity confirmed with the policy provider, although it is not a legal requirement. Annual membership of the British Driving Society does have third party insurance cover as a benefit of membership, although the level of excess should be noted.